In this 7th episode of SubscribeMe, I discuss 6 reasons why you should NOT send members-only content by email. Why not simply use email to deliver content? Why bother with a membership site, membership software and all the setup & maintenance headaches? Let me first show you how to create the world’s quickest membership site – in just 4 hours. Signup for an account with Mailchimp. They allow you to have up to 2,000 subscribers on your list, and send out 12,000 emails per month. So that’s about 6 emails per month. 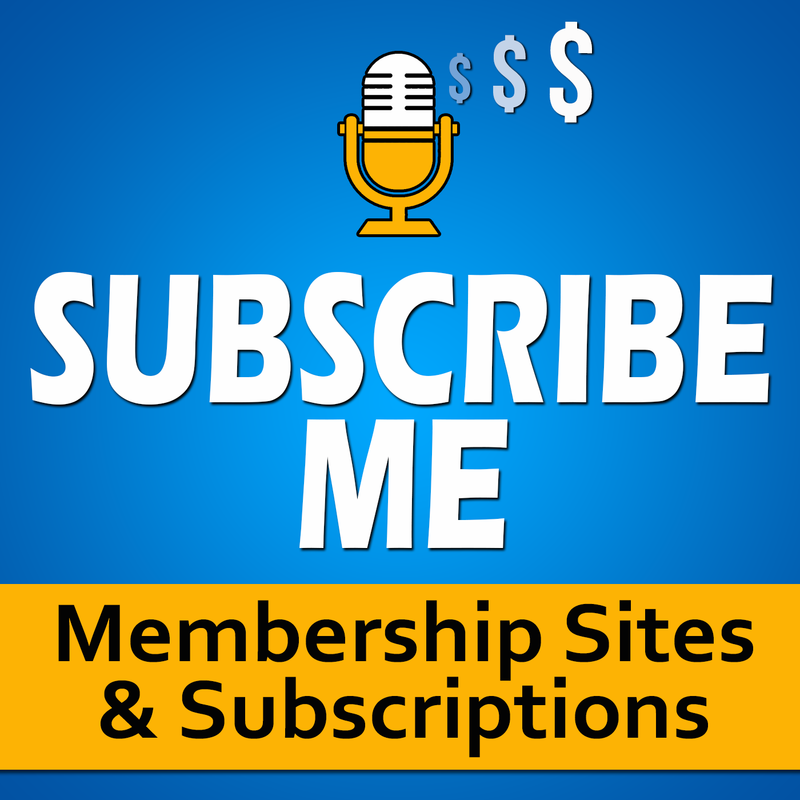 Go to subscribeme.fm/mailchimp, and get $30 in free credit to use when you exceed 2,000 subscribers. Load up all of your course content into an email autoresponder sequence, set up these emails to go out once a week. You could even start with just the welcome email and content for module 1, since you will be dripping the emails over time. Create a one-page landing page through a free WordPress.com web site. Log in to Paypal, create a buy button, and put it on your free one-page sales page. That’s it! You could be done with this basic membership set up in about 4 hours. And you could launch it tomorrow. So, if creating a membership site with just email can be done in 4 hours, then why even bother buying specialized membership software? Why bother with all of the setup and maintenance headaches of installing and running your own membership site, and spending time and money setting up a member’s area, and creating your content online, and protecting that content? So why bother with all that work? In order to automate everything for yourself and your customers, you need a web site. And simply throwing up a WordPress installation on your site is not going to help you automate payments, automate member-account creation, automate content delivery, send out follow-up and marketing emails, allow members to access private content, watch videos, listen to audio, download reports and documents. In the next episode, I’ll discuss membership software evolution, and what features you should look for when selecting membership software, and things that you don’t eve know that you don’t know. But in this episode, let’s discuss how to use email to deliver content. Like I said earlier, you could just create an email list, sign up subscribers, and send all of your member content via email. But that is just a bad idea for many reasons. That is because Emails, while they are terrific for marketing and transactional messaging, they’re simply not suited for delivering interactive content or rich media – like video or audio, or for private members-only content that should only be accessible by a select few, and they’re also not suitable for creating social interactions. Let’s look at these in detail. In this 6th episode of SubscribeMe, I have a very, VERY special guest. I was a guest on the Thriving Entrepreneur Radio Show hosted by Steve Kidd. Steve has an amazingly gentle way of asking great questions, while offering his own perspective along the way. And Steve has a program called “Write Your Best Seller” where he helps you become known as an authority, get on TV, become an amazon best seller among a host of other promotional services. Check out his program by going to Subscribeme.fm/authority/ . After he interviewed me, I wrote to him and asked him if I could publish the interview on my own podcast to my own listeners. And he very generously agreed. Thanks, Steve! In this 5th episode of SubscribeMe, I pick the brains of Ryan Lee, a veteran online marketer from Connecticut, Host of the Freedym show at Freedym.com – and one of the earliest people to start a membership site online. Ryan started his first membership site in 2001. The previous year, in 2000, I had just moved to New York (from India) with my wife and daughter (my son was born in the US several years later). Ryan has seen the evolution of the Internet Marketing industry, and has launched many successful web sites. He has previously been a writer for Entrepreneur.com online magazine, and lives in Connecticut with his wife and 4 daughters. On the show, Ryan and I talk about the early Google, the now defunct Goto, ClickBank, Paypal, hustle, “Ask and you shall receive”, the importance of building a recurring-income based business, personality-based marketing, emailing you list without worrying about unsubscribes, how much of yourself should you share with your audience, and keeping your members around for long and reducing churn. Ryan’s enthusiasm and energy is contagious, so listen to the show and you will get inspired and take home lots of actionable tips. In today’s show, I answer a question from Michael Britt, who has been super-successful at creating lots of content, has millions of downloads of his podcast and his youtube videos, but has not had much success at monetizing 9 years of hard work. I went to your web site, ThePsychFiles.com. I’m just amazed at the amount of content you’ve put on that web site. I think the problem might be that you’ve just kept creating content for years, without any kind of structure or specific goals. And you’ve been creating products without identifying who your target customer is. Now, I admit that I don’t know the first thing about your topic. But even given that, when I go to your web site, I can’t really make out who it is really for. Is it for students studying psychology for a college degree? Is it for the casual person looking to learn about psycology? Is it for people who are looking to learn more about psychology because of a loved one who has an issue? The content is just too much, and it is all over the place, from what I can tell. You have a very weak call to sign up for your newsletter at the top. Doesn’t state any benefits. Just “sign up for my newsletter” is not going to cut it. Instead, it should be something like “Get the top 10 memory boosting tricks that are borderline illegal, have been baffling both scientists and students – and will rewire your brain like you are Sherlock Holmes”. Have a nice digital image of a great report. Say how many times it has been downloaded. Why it helps. Benefits. Who all it helps. “Whether you are a teenage student or you are 60 years old and you have just been diagnosed with Alzheimers”. Your site has brain stuff, it has an app for test prep, talks about psychology games, it has psychology news. I think you know so much about so many things, that you just kept creating content as and when you got inspired, or thought about a subject, and you kept publishing it on your site. Problem is that it’s all on the same web site. So you tried to become an app developer, a psychology professor, a podcaster, and an internet marketer, all at once. And that’s why you’ve not found traction in any one thing. Listen to the show to see how I recommend overcoming this issue, and suggest things that will get Michael get a quick hit, a small win. And then build it from there. Let’s do a quick flashback. Back in April 2015, LinkedIn purchased online learning website Lynda.com for a cool $1.5 Billion. Lynda.com, at its very core, is nothing but a membership site offering online courses with videos and checklists and PDF document downloads. So when you have a membership site that earns recurring revenue, you increase the value of your business as a whole, and it will be easier to sell your site to a prospective buyer in the future, if you ever decide to walk away from it all. So a web site with recurring revenue has greater lifetime customer value, which will help you sell your site for a lot more than if you had just one-time products. Which is why a site like Lynda.com could get a valuation of 1.5 billion. Of course, they had millions of members, but the point is, that they weren’t just regular members, but members paying a monthly fee. And you too can create your own mini version of Lynda.com.